What makes GoldCoin different from other cryptocurrencies? Get informed about the key distinctions. You want to get involved in crypto, and the fact that you’re reading this means that GoldCoin caught your eye. The community is glad to have your attention. At the same time, we don’t expect you to take it on faith that we’re trying to build the world’s greatest form of money. As of this writing, there were already 1577 different cryptocurrencies. That number is only likely to swell with time. It’s perfectly natural to ask yourself: With so many other options, why does there even need to be a GoldCoin? There are many good answers to this question. Here are three of our favorites. The proliferation of cryptocurrencies occurs partially because developers want to accomplish different tasks. There’s nothing wrong with blockchain-powered distributed computing platforms that create their own coins, such as Ethereum and Ether (ETH). There’s also nothing wrong with building a privacy-oriented cryptocurrency, such as Monero (XMR). At the same time, such diversification of purpose introduces the potential for new modes of failure and vulnerabilities. GoldCoin is a stability-focused protocol for creating a peer-to-peer digital cash system as envisioned by Bitcoin creator Satoshi Nakamoto. People are certain to build atop it in the future. Concentrating on maintaining a base-layer protocol increases the likelihood that it will serve its core purpose faithfully. Few cryptocurrencies truly uphold the concept of decentralization. For instance, tokens like ripples (XRP) and Steem (STEEM) include features like permissive and open-source software licenses. At the same time, they’re maintained by privately held companies. This isn’t to say that there’s no middle ground or that these tokens’ structures doom them to failure. If you’re in search of a coin that lets you contribute without potentially competing with corporate influence, however, there are only a few options. 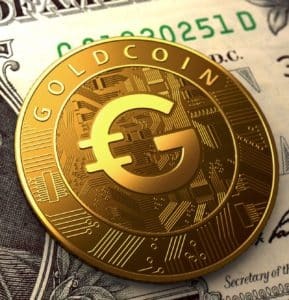 GoldCoin offers the chance to get in at ground level and take a proactive role in how cryptocurrency works. What does the term hard money mean? Traditionally, it denotes currency backed by specie, or money in coin, standards. Fiat currency, such as the modern U.S. dollar, isn’t really pegged to anything. GoldCoin was intentionally created with this concept in mind. Instead of backing it with gold or other real-world assets, however, the developers used something more reliable. Math ensures this currency’s inelasticity, or consistency in the face of changing economics. This coin is completely digital, but the dynamics that determine its worth are rock solid, independently verifiable and deflationary. It doesn’t matter whether you’re a small business owner in need of a payment system or an traders seeking a stable value store. GoldCoin is made to deliver supreme reliability in the broadest range of use cases. Is GoldCoin the ideal trading vehicle for everyone? Maybe not. Is it going to change the way humanity uses currency overnight? It’s unlikely. It’s important to remember, however, that GoldCoin’s foundations are rooted in continuous grassroots involvement. This community is passionate about empowering people to decide monetary policy. There are many ways to accomplish such ends, and we’re all about improving GoldCoin’s strategy. More importantly, we’re open to good ideas and community involvement. Want to learn more about our philosophy? Check out the wiki. Next PostWant a Good Crypto Coin? Find a Good Wallet.